The Gefen EXT-DVI-1CAT6 extends DVI over one CAT-6 cable. The Gefen DVI Over 1 CAT6 Extender will send a single-link DVI video signal over just one (1) CAT-6a cable at distances of up to 200 feet (60m) at 1920x1200@60Hz. 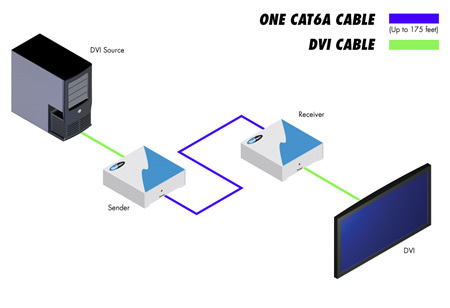 Extension of DVI can now be simplified with the use of a single CAT-6a cable. Other solutions use at least 2 CAT5/CAT6 cables to accomplish this. The Gefen DVI Over 1 CAT6 Extender fully supports all of the DVI specification for true compatibility with DVI devices. The Extender's pure digital transmission method insures 100% signal integrity over this single cable extension solution. The DVI Over 1 CAT6 Extender system consists of Sender and Receiver units. The DVI source (computer, set-top box, or DVD player) connects to the Sender box with the supplied 6-foot DVI cable. The Receiver box connects to a DVI-compliant video display. One CAT-6a cable links the sender and receiver together at distances of up to 200 feet. Power is applied to both the Sender and Receiver with the included 5V DC power supplies. The original DVI source image now appears flawlessly on the extended display. This device is an HDCP-compliant device. If CAT5 cable is used a reduced distance will result.